I've stumbled across a fun little chess trivia game that you can spend 5 or so minutes playing. It is from the Sporcle website, which I assume has a whole lot of these little trivia games, covering a number of different categories. But rather than just be a straight forward "how many can you answer" type quiz, the goal is to make your way from a8 to h1 on the chess board. Starting at the the top left, every time you correctly answer a question it reveals questions on adjacent, but no-diagonal squares. The goal is to reveal, and answer, the question on h1 in as short a time as possible. My first attempt took around 2:30 but taking advantage of the fact the the questions do not change my second attempt took 44 seconds. If you want to have a go then just visit http://www.sporcle.com/games/survivor/easier-than-beating-kasparov and see how much you know. The Tuggeranong Chess Club and the ACT Chess Association are pleased to announce that the 2015 Vikings Weekender will be held on the 14th & 15th November 2015, at the Tuggeranong Vikings Rugby Union Club, Wanniassa. This long running event is the third of Canberra's 3 weekend events and has seen a growing popularity in the last few years. The tournament will be run in 2 sections, with first prize in the Open of $1000, while the first prize in the Under 1600 event (sponsored by O2C) is $500. You can enter the tournament online at http://vesus.org/festivals/2015-vikings-weekender/ and download a tournament brochure at the same link. The Auckland Chess Centre is once again hosting the George Trundle Masters, which provides opportunities for both New Zealand and Australian players to earn title norms. This years event sees a field of 4 Australian's, 5 Kiwi's and 1 Frenchman taking part. Top seed is Australian GM Darryl Johansen, with the rest of the field pretty evenly matched in the 2260-2360 range. The first round saw 4 of the 5 games ending decisively, with 3 of the 4 wins going to Australian players. Darryl Johansen played a nice game against FM Bob Smith, while FM Karl Zelesco's win over FM Tim Reilly gives a good start to his chase for an IM norm. Results of the event (and the Challengers) can be found here. Unfortunately there does not seem to be a live broadcast of games, but games should be available at some point. Just had a quick look at the latest results from the 2015 Malaysian Open and Australian IM's Moulthun Ly and Anon Smirnov are well placed after 7 rounds. Ly is tied for third on 5.5/7, while Smirnov is in the next group of players on 5. While both also have TPR's of over 2500, unfortunately even a 2/2 finish for wither player won't result in a GM norm, as neither of them can play the 3 GM's required for a valid norm. Smirnov has played 1 so far (but has a non gm in round 8), while Ly has not played any of the 8 GM's in the 141 player field. Further back are IM's Junta Ikeda, Brodie McClymont and Max Illingworth (who are all on 4.5/7). Despite the distance they all travelled, McClymont plays Ikeda in round 8, having played Illingworth a few rounds earlier! One of the criticisms of the World Cup format is that the matches (2 games) are too short to be a fair reflection on the strength of the respective players. A first game loss in a match between players of near equal strength is almost always fatal, while the safe option of draw-draw results in the lottery of rapid chess. While this is true for most matches, one player is simply winning his matches and moving on to the next round. Pavel Eljanov started the event with 2-0,2-0,2-0 before easing up with in round 4, tying 1-1 with Jakovenko. However he won the first set of rapid matches 1.5-0.5, and then eliminated Nakamura 1.5-0.5 is round 5. He is +7 in the classical games (7 wins, 3 draws) , which is 4 points better than the remaining players! 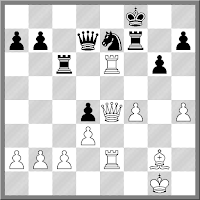 Here is the first game of his match against Nakamura, where he gave up 2 pieces for R+2 pawns. To borrow from computer chess R+P v 2 minors generally favours the minors by half a pawn, but R+2P is around half a pawn better for the R. This seemed to be confirmed in this game, where Eljanov looked better after the swap, but still had to work to finally convert. The diagrammed position came from a tournament game I played the other night. My position had been better for quite a while, but I spent a lot of time shuffling about, trying to find a way to crack my opponents defensive set up. His last move was 29. ... Rc6. A new chess program by the name of Giraffe is causing a bit of a buzz at the moment, due to the fact it seemingly taught itself to play chess at the IM level. Lots of "what hope is there for humanity" headlines have accompanied this story, although it isn't the spectacular breakthrough that some writers think it is. Certainly the notion that a chess engine can improve its own play is an intriguing one, but isn't entirely new. The Knightcap chess engine was doing this 10 years ago, although there are some differences between knightcap and giraffe. The major one is that Knightcap had its evaluation features coded into the program, and then learned how important each feature was, based on competition play on FICS. Some feature were weighted more heavily than others, depending on how they contributed to the final result. In Giraffes case it had significantly less features coded (although it include material, piece square tables and king safety), and then tried to discover new features, based on using large learning sets of data. The position were initially scored by Stockfish (another engine) and the goal was to get as many matching evaluations as possible. On its own this isn't anything special, but then Giraffe used this information to help it in searching for moves. Rather than just use a normal Alpha-Beta style search (which depends on move ordering for efficiency), Giraffe used a probabilistic search, where nodes are investigated based on the likelihood they are part of the principal variation (ie the main thread of the game). Assuming that the position isn't overwhelmed by tactics (where material is just going to dominate), such an approach should result in more 'human like' moves, rather than mysterious computer moves. It is this feature which is exciting, although whether it is enough to overcome brute force searchers remains to be seen. You can check out the paper on Giraffe here, and see for yourself how it all works, noting that Knightcap does get plenty of mentions in the paper. Australian TV Viewers are no doubt familiar with the Australian new program Q&A. Shown on the ABC, it discusses politics and current events in front of a live audience, who participate in the process. The other gimmick it uses is showing live tweets from viewers, although this is where it sometimes does go wrong. Although tweets are screened, some clever ones slip through, causing a degree of embarrassment for the show, and the ABC. Watching the 2015 World Cup on Chess24, I see the same sort of issues happening. The comments from online spectators are a mixture of the clever, the insightful and the downright delusional, and are often more entertaining than the chess. Case in point is the ongoing Wesley So - Maxime Vachier-Lagrave game. MVL has N+2P v 4P and is certainly better, if not winning (although this may require exact play). But to read the comments, So is just one move away from drawing the game, if not actually winning the position. Clearly an influx of So fanboys has overrun the comments section, but I do wonder which game they are actually watching. Attempts by more objective spectators to bring some reality to the proceedings are brushed aside as the inevitable So victory is breathlessly, and constantly, being announced. Nonetheless I don't object to spectators commentating on games, no more than I would try and stop what people yell at football matches. It is part of the colour and spectacle of modern chess, and if we cannot fill stadiums for tournaments, we can at least fill the internet! Round 3 of the 2015 FIDE World Cup ended in controversy, after Hikaru Nakamura beat Ian Nepomniachtchi in an 'Armageddon' game. 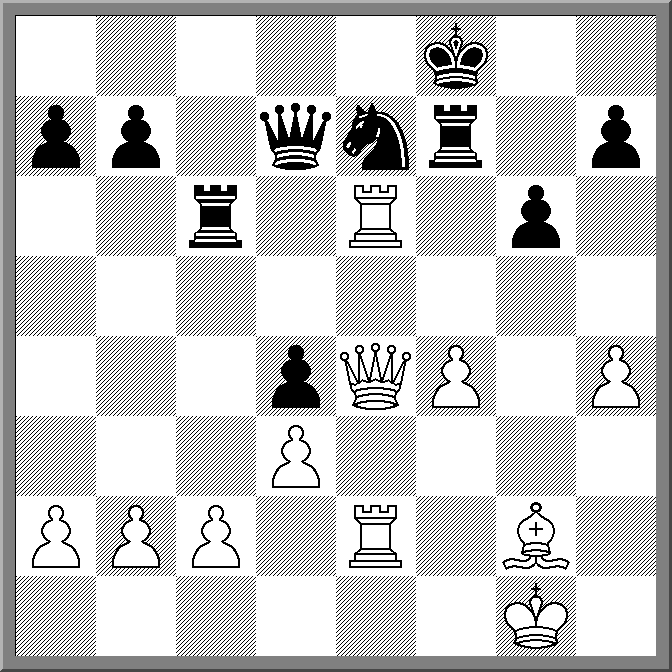 Early in the game Nakamura castled with two hands, in direct contravention to Article 4.1 of the FIDE Laws of Chess. As the game was played in the presence of an arbiter, the first thing that should have happened was that the arbiter should have immediately intervened. Although the game was a blitz game (in terms of time), Article B.3 of the Laws of Chess specify that the game is played under Competition (ie standard) Rules, as it is being observed by an arbiter, and recorded by electronic means. However the arbiter(s) did nothing and the game continued. After the game, which Nakamura won, Nepomniachtchi filed a protest which was handled by the appeals committee. The appeals committee allowed the result to stand, which only compounded the mistake made by the arbiter. The argument from the appeals committee was that Nepomniachtchi was at fault because he failed to stop the clock and inform the arbiter that an illegal move had occurred. I have a couple of problems with this reasoning. Firstly, the job an arbiter does is not dependant upon the players playing the game. If you are tasked with ensuring the Laws of Chess are strictly observed (Article 12.1) then that's what you do. And this should have been the starting point for the Appeals Committee. Once it is established that the officials failed to do their job correctly, then the Appeals Committee should have at least ordered the game to be replayed (IMO). (Note: In at least two occasions where actions of the officials in contravention to the laws of chess have affected a games result, I have recommended the replay of the game). The other issue is that FIDE itself have been pushing for a more interventionist role for arbiters. While a member of the FIDE Rules Commission (from 2008 to 2014), there was a clear directive from members of the FIDE Presidential Board that all competition chess should follow the same set of rules, wherever possible. This resulted in changes to the laws regarding blitz chess, where arbiters now *must* flag players, rather than leaving it up to players to notice. Personally I was opposed to these changes, but once a FIDE VP lobs into your meeting and tells you what the new rules will be, there is little room for argument. So the notion pushed by the appeals committee that it was only up to the player to make sure the rules were enforced is somewhat contradictory. Of course, having been the subject of a disciplinary process by FIDE, having contradictory outcomes depending on the people involved is not unknown, so such inconsistencies are not that surprising. Small comfort for Nepomniachtchi, but at least he was refunded his $500 appeal bond. That great Canberra tradition, the Lifeline Bookfair is on again this weekend, and once again provided me with an opportunity to pick up some second hand chess books. But unlike previous years, I was a little late to get going, as I was busy on Friday running a school chess event, rather than standing in a queue of 500 people waiting for the doors to open. This gave other collectors first bite of the cherry, while I arrived a number of hours later to pick through the scraps. However, even with the delayed start there were quite a good collection of books there, although my choice was limited due to the fact that I already owned copies of most of them. To my own collection I added copies of Logical Chess Move by Move, New Traps in the Chess Opening (from 1964 mind you) and Learn Chess (to replace a missing copy). One new addition was Brilliance in Chess by Gerald Abrahams, which was a title I was previously unaware existed. Books I did not buy included Chess Praxis (there were even two copies on offer), Nigel Short's Chess Skills (which someone else pointed out is a very slim book), and Purdy's book on the Fischer v Spassky Match. I'll intend to head back tomorrow afternoon for one final search, but I suspect that all that's left is what I have already seen. But at least the advantage of going at the end of the sale (as opposed to the start) is that everything left over is heavily discounted, so what I miss out in quality, I may make up in quantity. A number of Australian and New Zealand players have jetted off to Malaysia to take part in the 2015 Malaysian Chess Festival. The Festival has started with the Astro Merdeka Rapid Teams Championship, with a field of over 100 4 player teams (plus a heap more in the Under 12 section). The two Australian teams are the Doubleroo team which includes IM Alex Wohl and IM Brodie McClymont (currently in 16th place), and the Klang Valley Koalas, with FM Lee Jones and Alana Chibnall (tied for 46th). The New Zealand team are the Klang Valley Kiwi's and they are also tied for 46th. There are a further 6 rounds to play tomorrow, and then their is a blitz event in the evening. Following that is the Malaysian Open, which is a 9 round International swiss, with other events held alongside. While I am not a fanatical Blackmar-Diemer Gambit player (no it isn't a forced win for White), I do enjoy playing it when I get the opportunity. I usually wheel it out as a response to the Scandinavian (1.e4 d5 2.d4!) as starting with 1.d4 gives Black more choices to play openings that I do not like. The following game was played recently at chess.com, with a 3 day per move time limit. Aiming for the usual king side hack I was surprised to see my opponent exchange on f3, until he dropped 12. .. Bxh2+ on me. Luckily for me I could move my king, and resultant extra tempo was just enough to start the attack with 13. Bxf6. The key idea was to get the Queen to h6 (cutting off escape squares), and even though I gave up a piece he had to return it straight away. After that I won back all my material, chased the king across the board, and then ... took another 35 moves to win. Of course if you are using this game as part of your BDM repertoire, I'd just look at the first 22 moves. After that it is bit more hodgepodge, although I did win queen for rook and then had great fun zigzagging my queen around the board. Today is playoff day for Round 2 of the 2015 World Cup and already another set of big names have been tipped out. After drawing both his regulation games Lev Aronian might have been hoping to win the rapid games, but Alexander Areshchenko had other ideas, winning 2-0 to advance to the third round. Nikita Vitiugov lost to Quang Liem Le, but Svidler, Nakamura and and Giri all went through after 2 playoff games. There are a number of high profile players still to finish their playoff matches, including Michael Adams, Sergey Karjakin and Alexander Grischuk. As it stands they have another 2 games to play (minimum), and the closer they get to armageddon, the closer they get to going out. Round three is where the heavyweights start to clash with the (if I have read the tables correctly), Svidler - Radjabov and Giri - Leko matches looking quite interesting. One of the more interesting games on the first day of round 2 of the 2015 World Cup involved the dreaded Rook+Bishop v Rook ending. It occurred in the game between Vladimir Kramnik and Lazaro Bruzon and ended in the way that a lot of games involving this ending do. Once the ending was reached on move 75, Bruzon (with the rook) defended and defended making sure he avoid any mating nets etc. Kramnik kept pushing and pushing, hoping for a slip from his opponent. Of course such defending is hard work (having done it once myself) and on move 115, Bruzon moved his king to the wrong square and resigned a couple of moves later. A real heartbreaker for Bruzon, who is now losing his second game to Kramnik as I type this. In the other matches, David Navara has been knocked out by lower seeded Gadir Guseinov, Sethuraman has knocked out countryman Harikrishna, while Michael Adams and Sergey Karjakin have evened the score after losing yesterday. Not sure if players are thinking ahead, or round 1 was a little tougher than expected, but there were a number of very quick draws in the first day of the Round 2 matches at the 2015 World Cup. With no 'Sofia' style rules in play, a number of players shook hands before the 2 hour mark, including Veselin Topalov, who is normally not noted for this behaviour. Of the games that are still in progress, most are running in favour of the higher rated player, although Krjakin has lost to Onischuk in what is probably the biggest upset of the day. If you wish to follow the ongoing games, or just catch up with the results, the tournament site is here. I'll probably begin to throw in some extra posts for this event, as not until I wake up in around 7 hours before I get an overall picture of what happened, and can select an interesting game or two to feature. There are so many things to this story I am not sure where to start. Playing chess at a games convention (Dragon Con) might not seem that special, but dressed as a Jawa (from Star Wars) starts to make it interesting. Doing it to raise money for charity is quite nice as well, but the real kicker for me is fitting chess into the Star Wars universe. The player concerned, Stephen Eisenhauer, might have difficulty getting into a regular chess tournament dressed as he is (Anti-Cheating regs would be the most obvious impediment), but the fact that he has formed the Tatooine Planetary Chess Federation might grant him a special exemption (on cultural grounds). And having formed an extra-terrestrial chess federation he should go the whole way and apply to join FIDE. I am sure he will find a receptive ear in FIDE President Kirsan Ilyumzhinov, who has had previous experiences dealing with off world visitors. If anything, Kirsan may approve the membership simply as an 'I told you so' to his critics. While the round is still in progress, top seed Veselin Topalov has gone through to the second round with a 2-0 win. He has been joined by Svidler, Aronian and Caruana (amongst others), while a few high profile day 1 losers (including Wang Hao and Moiseenko) bounced back to tie the match with day 2 wins. The 2015 World Cup in Baku has started with a few small surprises, but nothing too dramatic. The top seeds either won their games, or at least drew, although some draws seemed harder than others. Anish Giri played 158 moves against Arthur Ssegwanyi, trying to convert a pawn advantage in a rook ending, but determined defence saw the game end with just kings on the board. Leinier Dominguez Perez was the highest seeded player to lose, being beaten by Federico Perez Ponsa on board 18. Hrant Melkumyan also had a good start, beating the higher rated Gata Kamsky on board 47. For Australian fans, Max Illingworth started his game against Pentala Harikrishna well, and even had a slight advantage in the middle game. His passed a pawns were dangerous, and eventually he was able to win a piece for them. Unfortunately the extra pawns that Harikrishna had in return proved to be more dangerous and Illingworth was unable to stop them charging down the board. Tonight is the second half of the round one matches, with any tied matches going into playoffs tomorrow. I suspect higher seeded players already ahead will be happy to draw, although the other matches should remain competitive. While not an expression that is used that often, an 'immortal' game (as opposed to "The Immortal Game), is a game where a player sacrifices a queen and two rooks to checkmate their opponent. As a further refinement, the rooks should be captured on their starting squares, although I may have mis-remembered that part. Doing a quick search of my database I found a few examples of this motif, some which occurred quite recently. The last example I could find is from 2006, and is shown below. The other cool thing about this game is that not only did Black sacrifice most of his army, he executed a mate with the lowliest member, the humble pawn. The 2015 World Cup begins in Baku on Friday, with 128 players aiming to qualify for the Candidates Tournament, and pocket some prize money at the same time. The event has attracted a very strong field, with Veselin Topalov seeded No 1, Hikaru Nakamura at 2 and the recent Sinquefield Cup winner Lev Aronian seeded no 9(!). The Oceania representative, IM Max Illingworth (AUS) is in the bottom half of the pairings, and plays Pentala Harikrishna (14 seed) in the first round. Play starts at 3pm Baku time which is a fairly pleasant 8pm Canberra time. The official website is http://www.bakuworldcup2015.com/ and you should be able to get live coverage from there. If you are planning to cheat at chess using a computer you should at least try and be clever about it. The latest cheating controversy involves a player in the Imperia Chess Festival, who seemed to be playing extraordinarily well for some one with a 1600-ish rating. This in and of itself is not proof of cheating, although the Chief Arbiter did the sensible thing and investigated the player concerned. After a scan with a metal detector, it was discovered that the player, Arcangelo Riccicardi, had a camera in the pendant around his neck, and was receiving assistance from a confederate who was replying in morse code to a receiver hidden under his armpit. Some of the tell tale signs, according to the arbiter, was that he never left the board (as most players do), and he blinked when he was trying to decipher the messages. Of course the player was expelled from the event, and an investigation is underway. Probably the most interesting thing about this case (to me anyway) was that the method of detection was more akin to how a casino would spot a card counter, rather than through any chess related detection. Of course the good results were a tip off, but it was the amateurish approach that seemed to give the game away. If you are looking for a customisable chess interface, or just want to try and see how it works under the hood, then the latest release of Python Chess might be useful. It is a fully configured chess interface, written entirely in python, and even includes support for interfacing with uci chess engines. (NB It is not an engine itself). The author of the program, Niklas Fiekas, indicates in his documentation it is not intended to be a fast running interface system, but clearly he has put in a significant amount of work in getting the features right. It is even up to date with the latest changes to the Laws of Chess, automatically finding draws by the 75 move rule, and 5 fold repetitions. You can download the code from the pypi page or skip across to his github page to browse the code online. When I started playing chess seriously in the mid 1980's, the Evans Gambit was well an truly a sideline opening. Rarely seen at the top level, the general consensus was that Lasker's Defence had put it our of business long ago. In fact the only player in my immediate circle who used it as a regular weapon was David Austin, who had some quite good victories with it. The status of the Evans suddenly changed when Kasparov dusted it off and used it as a surprise weapon against his top 10 rivals. Suddenly it was back in fashion, at least for a while. But once the novelty wore off, it again declined in popularity, possibly condemned by the cold hard logic of the modern analysis engine. To be fair, the other reason it tends not to get played is that 1.e4 e5 2.Nf3 Nc6 3.Bc4 isn't always met by 3. ... Bc5. 3. ... Nf6 is a more fighting response, so much so that 3.d4 is now often the mainline if 3.Bb5 is not played (again Kasparov had a big hand in this). But just today I reached a position where I could play an Evan's, albeit via 2.Bc4. Initially I was surprised I even got to this position, and despite not being a serious Evan's player myself, the temptation to play 4.b4 was just to great. Fortunately I remembered enough of the general ideas behind the opening (sac all your pawns!) to play the obvious moves, and with a little help from my opponent scored a win in a manner that shows how dangerous it can really be as an opening. The 2015 World Under 20 Championships is under way in Khanty-Mansiysk, and while I am sure the chess will be of a pretty high standard, the highlight for me so far are the tournament reports. "Watch the Closing Doors" was the headline from round 2, and I assumed this prefaced a story of some unfortunate GM being mangled by an automated building, but I was wrong. "Watch the closing doors" was a chess expression that I was previously unaware of, as was the need to "slam the wicket", which was part of the same comment. I am assuming that the 'author' of these wonderful expressions was probably an automated translator, and that the whole thing made a lot more sense in Russian. Nonetheless, without making fun of the hard working bulletin editors, I recommend checking out the tournament bulletins at http://wjcc2015.fide.com/ , both the see how the tournament is going, and to revel in the colourful prose used to bring these games to life. Lev Aronian has won the 2015 Sinquefield Cyp after a final round draw with Veselin Topalov. Going into the last round with a full point lead, Aronian put himself out of reach of the chasing pack after Topalov took a draw by perpetual. This lead to a few more draws with Carlsen, Giri and Vachier Lagrave all getting to equal second after halving out. The other player to join them was Hikaru Nakaumra, who beat Alexander Grischuk in a game that had a very interesting finish. The win for Aronian seems to be a popular one, with most chess fans applauding one of the nice guys of elite chess (although most of the top 10 could be considered 'nice' these days). After a poor run of form over the last 12 months ot so, the win by Aronian adds yet another factor into the 'who will play Carlsen' question. Ah spring. For some people the 1st of September signals the return of warm weather (in the Southern Hemisphere), unless you happen to live somewhere like Canberra. Spring in Canberra is a bit of a trap, where the first 6 weeks are almost as cold as winter, then it gets windy for a bit, and then summer turns up 5 weeks early! But because we adhere to a set of seasons that kind of make sense in London*, Spring also marks the return to outdoors play for Street Chess. Ignoring the fact that it is probably colder in the first 2 weekends of September than the last 2 weekends in August, Street Chess will once again be played in City Walk, Canberra City. My tip for people planning to play in the next few weeks, dress like Scott of the Antarctic. But if you cannot do that, be prepared to invest in plenty of mulled wine and hot chocolate.